An American company has bought what remains of a pioneering environmentally-friendly power station in North Yorkshire. Biodevelopment International, which is based in New Hampshire, has taken over the Arbre power plant at Eggborough near Selby. The plant was designed by burn willow grown by local farmers. But in August 2002 the company behind the scheme went into liquidation before the plant was fully commissioned with the loss of 40 jobs. 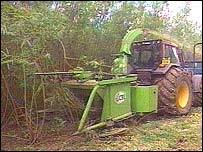 Dozens of farmers who signed 16 year contracts to grow willow for Arbre were left out of pocket with acres of coppice on their hands. Biodevelopment International have yet to announce what they intend doing with the Arbre plant. The company's website says its philosophy is to "conserve and optimise the earth's natural resources". But Selby MP John Grogan told BBC North Yorkshire this did not necessarily mean they would keep the factory open. He said: "I have spoken to them and they admit freely that the futre (of Arbre) is up in the air." Mr Grogan said they may decide to utilise the project's technology elsewhere. He added: "We'd obviously prefer them to use the plant, not just in the interests of Selby, but renewable energy in this country." Arbre was originally owned by the Kelda Group which also owns Yorkshire Water. In April 2000 it sold its green energy division to Energy Power Resources Ltd (EPRL). But Kelda agreed to continue funding the plant as long as it was considered viable.